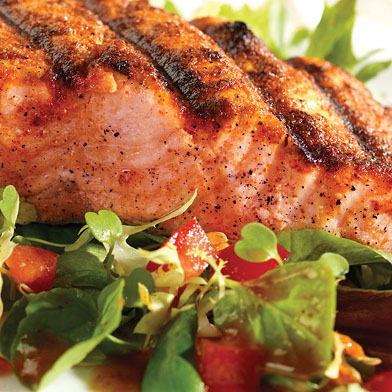 Make the most of salmon with the flavours of chilli, garlic, paprika and V8 Original. This is sure to give your salmon a bit of a kick! Mix together the chilli powder, garlic powder, onion powder, sugar, cumin, white pepper and paprika in a small bowl. Put aside 1 ½ tablespoons for the dressing. Cover the salmon in the mixture and then place in the fridge for approximately 6 hours. Oil the grill rack and heat to a high temperature. Brush the salmon with about one tablespoon of oil. Grill for approximately 8 minutes or until the salmon is cooked through. Using a fork or whisk, beat the V8 Original juice, vinegar, tomato and oil in large bowl. Add the salad leaves and gently mix until coated. Serve the salmon on a bed of salad.